1. Blend the cornflour with the soy sauce and 1 tsp sesame oil, add the beef and mix to evenly coat. Set aside for 20-30 minutes. 2. 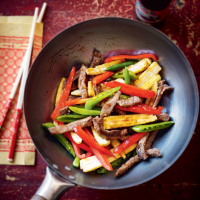 Heat 1 tsp sesame oil in a large frying pan or wok and fry the beef for 3-4 minutes, then remove and set aside. 3. Add the remaining sesame oil to the pan, then add the vegetables and stir fry for 5 minutes. Add the oyster sauce and the reserved beef, and cook for 1 minute to heat through. 4. Heat the rice according to pack instructions and serve with the beef.